"Art" is the activity of directing attention to things and providing affordances for interpretations. Which is why testing IS an art. "Art" is quoted. Are these scare quotes? Do they suggest some uncertainty, disagreement or ironic intent? Or are they merely an alternative to some stylistic markup such as bold font that you might see in a dictionary definition? "Is" is emphasised in the second sentence. On that verb, that kind of marker might signify a refutation of some other assertion. Could that be the case here? What else might it be contributing? Both "art" and "an art" are used. The former is frequently defined in terms of beauty whereas the latter is usually applied to a task that requires skill (e.g. Oxford Dictionaries). It's possible for one thing to be both. Is the use of both deliberate? Is it significant? Natural languages contain much exception and idiom and do not lend themselves to rules and conventions. Which is why testing IS a language. "Affordances" is a relatively uncommon and quite technical word. Wikipedia describes an affordance as "a quality of an object, or an environment, which allows an individual to perform an action" but points out several variant usages. Might it have been chosen because it is the only word that gives the precisely nuanced meaning that was desired? Or because its rarity provides memorability to the whole? Or something else? Whatever the reason, it's a sore thumb here and potentially brings more than its core meaning. The first sentence might be a definition of the term "art". It might be metaphorical or analogy. It might be explication. It might merely be attributing some property to the concept. Which is it? It is any? Could it be more than one? The format of the tweet is syllogistic, probably a variant of the Fallacy of the Undistributed Middle in which there's an implicit premise, "testing is the activity of directing attention to things and providing affordances for interpretations". If you interpret the text literally, then it is subject to a potential logical fallacy and the extent to which you accept it depends on the extent to which you believe that the set of all art encompasses the set of all testing. Even if your interpretation is not literal the implicit premise is hard to avoid. Semantics is the study of meaning. Compositional semantics builds the meaning of the whole from the meaning of the parts. For instance, you can work upwards from the meanings of words via the grammar of each sentence to the meaning of the entire tweet. Restrictions are placed on higher-level potential interpretations by concrete interpretations of the components. But it's both a bane and a beauty of natural language that the information transmitted can be a gestalt: more than the sum of the words. "Pragmatics" is the identification and application of context to observation. Which is why testing IS pragmatics. Perhaps the structure of the tweet is simply a rhetorical device for attributing characteristics to testing. It doesn't do to overlook the obvious. Sometimes. There's a tradition of discussion about whether testing is an art and/or a science, or art or science, or artistic or scientific. The tweet locates itself in that tradition by its subject matter. "Art" is an activity that is driven by aesthetics. Which is why testing is NOT an art. Perhaps it is sarcastic, trying to illustrate the way that carefully chosen wording can associate two distinct concepts to justify some position. Michael has a self-declared Mcluhanite tendency to say things for their provocative effect, to make others think. So perhaps I've fallen into his trap and I'm self-yanking my chain here. Perhaps it's just a throwaway tweet and doesn't bear any inspection: it's not intended to have any meaning beyond recording a thought in the moment it was originated. Language can be a noisy channel for communication and Twitter as a medium naturally emphasises this because of its limit on length. But in other places other constraints apply - time, budget, the expected reader, the skills of the writer and so on. In those places and at those times where we need to minimise noise and maximise signal the onus is on us to do so by considering the kinds of messages we're sending or receiving: the words themselves and the context in which they're bundled. 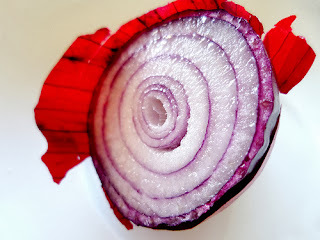 Onions are made up of layers which can be difficult to uncover individually without skill and effort (and they can make you cry). Which is why testing IS an onion. P.S. Michael was kind enough to criticise an early draft of this post and my motivation for writing it. Somewhat ironically, but entirely correctly, he identified that both could be clearer.